—The new Presepe Elect. In October, a few weeks before the U.S. presidential election, candidates Obama and McCain had some fun at the 63rd annual Alfred E. Smith Memorial Foundation Dinner, a charity event sponsored by the New York Catholic archdiocese and held on the premises of the Waldorf Astoria hotel in New York City. The two "roasted" each other and themselves, much to the delight of a nation weary of the two-year-long presidential campaign. One of Obama's self-effacing quips was to the effect that he had not really been born in a manger as many people think, but rather on the planet Krypton and sent here by his father, Jorel, to save Earth! — Obama may not have been born in a manger, but the presepe (Chistmas creche) tradition in Naples updates itself very quickly, and the president-elect is now at least present at Mangerside. 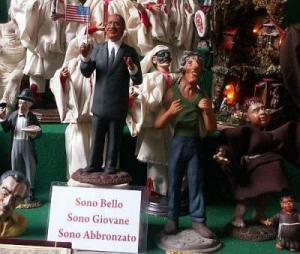 Besides traditional figurines of the Holy Family, shepherds, sundry heavenly hosts and local additions such as Pulcinella, a shop on via San Gregorio Armeno in the historic center of town (map here) features creche figurines of politicians—past and present, local, national and international. This tradition goes back to the early 1990s when the shop started featuring persons involved in the nation-wide anti-corruption campaign nicknamed "Clean Hands." The original proprietor of the shop, Giuseppe Ferrigno, passed away recently, but the shop's brand of irreverent but inoffensive, even hilarious, figurines continues. Yes, you can now get your very own figurine of Obama for your yearly Manger display! The sign beneath Obama says "I'm handsome, I'm young, I'm tanned." That is not a racist slur by the shop-keepers, but rather a jibe at Italian prime minister, Berlusconi, who made a recent remark that Obama would do well because of those qualities. Berlusconi thought it was a good-natured, amusing remark. It was totally beyond his limited comprehension why anyone would find it offensive. —Speaking of that part of town, the city may have given up in its attempt to enforce one-way pedestrian (!) traffic on the main thoroughfare, known as Spaccanapoli (officially via Benedetto Croce and then via San Biagio dei Librai). Forget salmon swimming upstream; you cannot walk against the flow on this street on a crowded day in the holiday season no matter how earnestly you are seeking to spawn. Yet people try, so the city passed a one-way ordinance for the duration (meaning through Christmas). German and Japanese tourists, of course, obey—as they have historically been wont to do, Neapolitans, of course, think it's all a big joke. In a city where everyone jaywalks, such a law is unenforceable. (I am now going down there to test it, to pit my heroic sense of individualism against the authoritarian overlords of City Hall. In a pinch, I'll turn around and walk backwards. Bring it on.) Speaking of things verboten, I've just read another silly entry in the long list of words that one avoided during the Fascist period in Italy. It was unconsidered un-Italian to use foreign words when there perfectly good Italian words available; thus, you said mistura (mixture) in place of the plutocratic American enemy term cocktail. The list is as long as it is stupid. (It's somewhat similar to what the French are still trying to do when they insist on moteur à reaction instead of the English jet. Anyway, I just read a wartime reference to one Benedetto Buonuomo. (Wait for it....) Benny Goodman! —Someone has suggested paying for the coast of restoring parts of the Castel dell'Ovo (Egg Castle) by letting advertisers use the huge facade. That would be nothing new in Naples (see this entry on gigantic advertising); recently, even the western facade of the San Carlo opera house was a giant billboard for months on end. 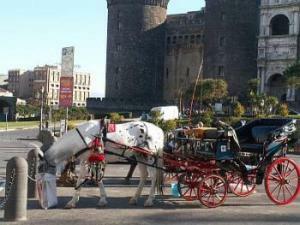 The Egg Castle is a bit different, however; it is the most visible large monument in Naples and iconic of the city; it is what all tourists see when they come to Naples. As a matter of fact, many of them see it from their balconies and windows since the castle faces the long row of 5-star hotels along the sea-front. Surely, they don't want to look at the world's largest billboard. Some have called the proposal "obscene"; others call it temporary and not a bad way to defray expenses. I hope they do it just so I can get a picture of it. I am betting that they won't. Stay tuned. —At this time of year, we note the existence of a benevolent organization, Crescere Insieme (Growing Together), an organization founded some 20 years ago by Rosario Fiorenza in the Sanità, one of the most isolated and poorest sections of the city. The organization helps young drug addicts by providing a day-and residence center and social services with the goal of returning the young people to society as healthy, functioning members. Crescere insieme gets no public funding; it exists on donations and on money made from selling a vast array of ceramic items, primarily figurines for the traditional Neapolitan presepe and characteristic figures such as Pulcinella, all made by the young people.